Birch Hill Station is the quintessential Central Hawke's Bay sheep and beef farm. 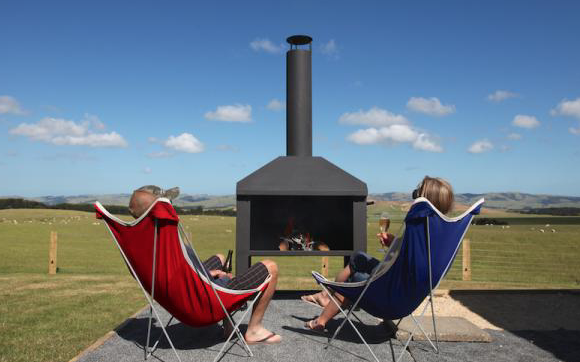 Accessible to both Auckland and Wellington - it's perfectly situated for families or friends to gather for a country escape. Farm-friendly, fully vaccinated dogs are welcome too - which means no member of the family needs to be left behind! The luxury campsite is set on a sheltered and picturesque corner of the farm. Ideal for groups, the site can accommodate up to 9 people, in one large wooden-framed tent and two smaller 'sleeper' tents. 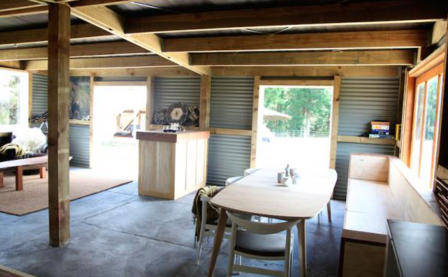 A fantastic fully enclosed kitchen, dining and camp lounge provides a communal gathering area. 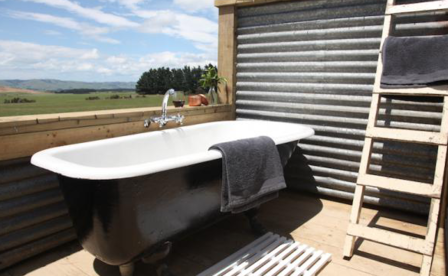 Stunning views from the front of the site stretch out over the rolling farmland of the Porangahau countryside. The back of the site is ringed with mature kanuka and pine trees dotted with hammocks for lounging in the hot summer weather. A gully behind these trees makes the perfect exploring spot for kids, while parents relax with a cool beverage, and enjoy the sun setting on the amber hills. By day you'll see and hear the distant farm animals and native birds. 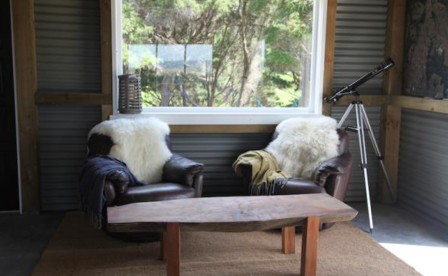 At night you'll hear owls (morepork) and see amazing stars in the clear country skies. If canvas walls aren't for you, or you're traveling with a larger group, Libby and Ben also have cosy cottage accommodation which you can book too! With 15km of safe, great quality fenced farm tracks, Birch Hill Station is an outdoor paradise for active people. 1300 hectares of scenic farmland and native bush offer great variety for walkers or mountain bikers. If you're a horse rider, you're welcome to bring your horse to enjoy the scenery on horse-back. If you prefer a less active glamping holiday, enjoy a quiet picnic by the stream, and wile away the time with a good book, listening to the sound of native birds in the bush surrounds. The surrounding area is great to explore too! Within 20 minutes drive of the property you'll find the place with the longest place name in the world - Taumatawhakatangihangakoauauotamateapokaiwhenuakitanatahu (try saying that!). You'll also find Porangahau village and the stunning Porangahau beach for some summertime swimming action - or wintertime beach walks. The campsite and cottage have excellent, drive on access with parking right next to the kitchen area for ease of packing and unpacking. Because your car is so handy, you can come and go from the property any time you please to either explore the local area or head off to the beach - just 20 minutes down the road. Check-in is between 3pm - 7pm. A later arrival can be negotiated, but there are strictly no check-ins after 9.30pm at night. Check-out is by 11am on the day of departure. Birch Hill is one of our dog friendly campsites. Dogs must be vaccinated, well behaved and calm around farm animals. The campsite is fully fenced with post & wire fencing. There are three tents available during the summer season to accommodate larger groups. The campsite is only ever used by one group at a time - whether there are two or nine of you! We think the campsite best suits either 2 or 3 couples, 2 families holidaying together or a group of up to 6-9 adult singles, depending on sleeping and sharing preferences. Tent One is a large wooden-framed tent with a 24sqm wooden floor space, sleeping up to 5 people. There is one queen size bed, a sofa bed (which can make either 2 singles or one king) and a single trundle bed. Tent Two is a luxury, standing height, pup tent. It has a 3.3m x 3.3m floor space and comfortably accommodates a queen size bed. 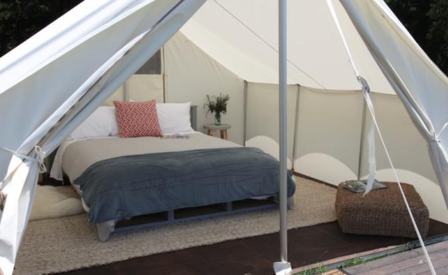 Tent Three is a slightly smaller luxury, standing height, pup tent. It fits two single beds. Birch Hill is completely off-the-grid, so has no electric power source. Energy for hot water and cooking is supplied via LPG gas bottles. Lighting is provided via solar powered lanterns that double as portable torches. These can be hung inside tents via hooks. The camp kitchen is spacious and well equipped, with hot and cold water, ample storage and plenty of bench space. There are BBQ and 2-burner gas ring facilities available for cooking. A solar powered music player is supplied at the site (with bluetooth). Beds are made up with 100% cotton linen and wool duvets. Extra torches - we supply plenty of lanterns and some solar powered lights but it pays to bring a few extra torches. Head torches can be particularly handy. Sleeping bags for children on the fold out couch/trundler bed - we supply a bottom sheet, pillow case and pillow for children or full linen if requested. Extra duvets are available. Mountain bikes - bring your bikes and explore the many tracks around the farm. Supervise young children carefully. There are specific water hazards for young children on the property such as water troughs and dams. Birch Hill is self-catering. Just bring your own food and chilly-bin and cook meals using the BBQ and facilities provided in your private camp kitchen. You'll find all the cutlery, crockery, pots and pans that you'll need. If you want a break from cooking at any stage, Porangahau Village is a 15 minute drive away and does some great Fish and Chips! For a special meal out try either Chapelwick or Wallingford Homestead, who take bookings by arrangement. The nearest dairy for basic supplies is in Porangahau Village, and the nearest supermarket is in Waipukurau, a 35 minute drive away. Birch Hill has a standard minimum booking period of two nights, however they do allow single nights during the week outside the peak holiday period of 20 December to 31 January. The minimum booking period for long weekends such as Labour Weekend, Anniversary Weekend etc is 3 nights. The minimum booking period for Easter is 4 nights. Where there is a single night gap between bookings during the main holiday period (20 December to 31 January), it may be possible to book that single night with a surcharge of $30. If you are interested in this option, please email us with your date request. The standard nightly rate for summer is $240 for up to two people. Additional people are $40 per adult, per night and $10 per child (under 16), per night. Babies under one year are free. Maximum number of people over the summer season is 9. The standard nightly rate for winter is $200 (couples only). Maximum number of people over the winter season is 2. Bring-your-horse - one off charge of $75 per horse. The quickest way to check availability and book is by using our online booking calendar. This is always up-to-date. Find the date that suits you, then click Book Now. You'll be taken through the booking process in a few easy steps. During the booking process, you’ll be asked to pay a 10% non-refundable deposit to secure your booking. Once you've completed the booking process and deposit payment, you'll receive a confirmation email. This explains how to pay the remainder of your balance, which is due 4 weeks prior to your arrival date. If you’ve booked within this timeframe, the full balance will be due straight away. We’ll provide bank account details for payment by Internet Banking deposit in the email, and we also provide a secure link so you can opt to pay by credit card. Credit card payments incur a 2.5% surcharge. Give the gift of glamping! Gift Vouchers are available for Birch Hill or any Canopy Camping Escapes glamping site. These are provided in electronic format, for you to print out and pop in a greeting card for the lucky recipient. Read more about our gift vouchers, including how to purchase one, here.